The wind integration model has a long history. A preceding tool used two time series: electricity demand and wind power. The residual load was found by subtracting wind power from the load, hour by hour. Based on the residual load it was possible to characterize the operational pattern of the dispatchable units. 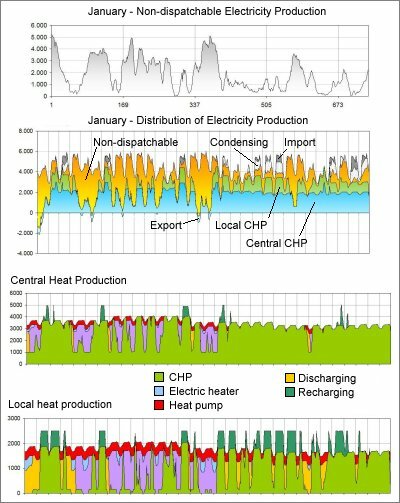 Combined heat and power (CHP) always had a significant influence on the power plant operation in Denmark, but in this model CHP was disregarded. In order to include CHP, the development had to start from scratch. Models of heat demand variations and of the two basic of CHP units, the counterpressure unit and the extraction unit, were essential elements. In later versions separate time series for offshore wind and photovoltaics (PV) were added. The tool is a spreadsheet including VBA programs. An imbalance of a power system can be due to power overflow or power shortage. Unavoidable imbalances are usually set off by exchanges with neighbouring power systems. Similarly a district heating system can have surplus or shortage of CHP heat. A district heating system has several options for solving imbalance problems. A hot water tank is a common and efficient solution. Additional heat can be produced by reserve boilers. The tool has two operating strategies: minimizing power system imbalance and minimizing CHP system imbalance. In real operation the outcome will be somewhere between these two solutions depending on international electricity market prices. It is a main purpose of the tool to demonstrate that proper interaction between the power system and the district heating systems can improve efficiency and reduce imbalance problems for both systems. The district heating systems are supposed to include energy storages, electric heaters and large heat pumps. These facilities are decisive for the flexibility of the coordinated energy system. The model will use electric heaters only when there is a surplus of wind and solar power within the power system concerned. Large heat pumps will be used when there is a surplus of power from wind, PV and CHP. The model does not convert electricity from condensing production or imported power to heat. The model distinguishes between central CHP systems and local CHP systems. As a main rule the central systems are using extraction units with the ability to produce condensing power on the top of the CHP production. The local CHP plants are counterpressure units producing electricity and heat in a constant proportion. A minimum electricity production can be specified for central power plants. 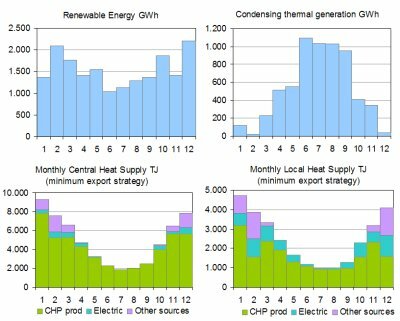 The tool works in two main steps: 1) Building time series for electricity demand, heat demand and non-dispatchable production and 2) simulating production of electricity and heat hour by hour for up to one year. Selected main results are shown separately together with input data for the case. Some results ar shown hour by hour on a separate sheet. This output was essential for debugging, but has been reduced in the current version in order to save computing time. It is an essential purpose to demonstrate operational details for both electricity and heat production. Therefore a selectrion of charts has been developed. In a power system CHP can be considered to be a constraint or an additional resource. Some dispatchable capacity is necessary to fill the gaps in the production profile of wind and PV. In a well balanced combination the CHP systems can provide better flexibility and better thermal efficiency than any other solution. This tool can demonstrate the potential and help finding suitable capacity combinations.